BRIGHT & BREEZY CONDO WITH DIRECT OCEAN VIEW FROM LANAI, LIVING AREA & KITCHEN! 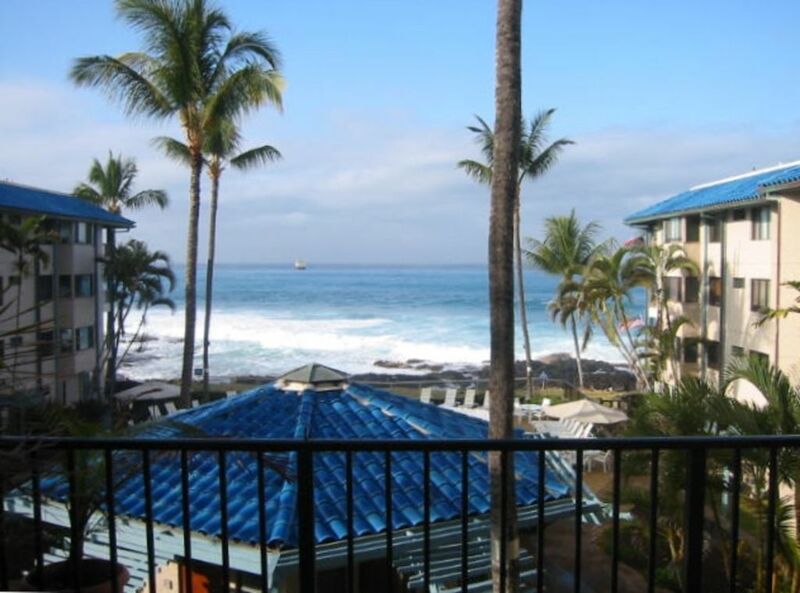 The Kona Reef is one of the most popular condo rentals in Kailua-Kona. Our ideal location on Alii Drive is just a short walk to the restaurants, shops & tourist attractions in our picturesque town of Kailua-Kona. Our spacious unit provides air-conditioning, phone, cable TV, VCR/DVD player and DSL internet access. The recently remodeled kitchen has granite countertops and includes microwave, ice-maker, dishwasher, and all dishes & cooking utensils. There is also a blender, coffee-maker & grinder. We enjoy a 'sit-down' ocean view from the lanai and livingroom, as well as a water view from the kitchen. Enjoy strolling along the shoreline or relaxing at our oceanfront pool & spa. A small white sand beach is adjacent to the Kona Reef, and other snorkeling & swimming beaches are within a short drive. At sunset you can barbeque and dine in the cabana area overlooking the pool and ocean. Nearby activities include fishing, golf, Kayak rentals and parasailing. Also available are helicopter tours, snorkeling cruises, dinner cruises and luaus. We had a wonderful stay in unit F4 at the Kona Reef. I cannot say enough about how accommodating Greg and Frances were to make our stay very pleasurable. The unit was very clean and we had access to everything we needed- beach chairs, cooler, umbrella, Etc. The condo is in a great location. It was easy to walk into town and from our lanai we watched the boats and the dolphins every morning. There is a nice little beach next to the condo. We can’t wait to go back to this condo. My husband and I love vacationing in this condo. It is lovely,clean and has a perfect view of the ocean and all the activity of the whales, dolphins, boaters. Also, we love being able to easily walk to town, Shops, market, and restaurants. This is the perfect spot and one we always want to come back to every year. The Reef is a great place to stay, and for the third year in a row we've had the pleasure to stay in F4 at the Reef. We love the easy in & out access from the parking lot, and the great view the unit provides, whether you are on the lanai, sitting on the couch in the living area, or in the kitchen doing the dishes. Comfortable, laid back, Aloha Spirit throughout the condo and the complex. Slept great (street noise is minor). We did not need (and did not use) the A/C the whole month. Great flow threw ventilation, thanks to a nice screen door at the mauka entrance & the makai lanai screen door. Ceiling fans also help, but not needed all the time. The Kona Reef is on the south edge of town, easy walking distance to restaurants (Huggo's, Bongo Ben's, etc), bars (Don's Mai Tai Bar, Laverne's), shopping (ABC Stores), etc. Honl Beach is right next door. We will be back next year! Aloha! Good deal & location for the money! The unit, amenities, and location were just as described. The owner provided good instructions regarding the unit, the complex and the area as well as let us use their boogie boards, beach chairs, etc., which really made the stay more enjoyable. Recommend going to Magic Sands beach to ride the waves and Kahalu'u beach for snorkeling! We would definitely stay here again. Great place to be to enjoy Kona. Enjoyed our stay. Room was reasonably priced and clean. Could use some cleaning in the knooks and crannies, but overall, clean. Nice pool and right up to the ocean. I’ve stayed in multiple units in the Kona Reef condos and this was by far one of the nicest and a great price. It was perfect for our girls trip to our friend’s wedding. It was close to where she got married and convenient for walking downtown.